Dr. Ryan Woodbury is originally from the Twin Cities of Minnesota and pursued his undergraduate degree in Colorado. He has had a passion for sports his entire life and was able to experience the benefits of chiropractic first-hand as a nationally ranked triathlete. Through his rigorous training he suffered a hip injury. It was the help of his family chiropractor that allowed him to make a full recovery, perform at an optimal level, and set personal records in cross country and track. It was this experience that motivated him towards becoming a doctor of chiropractic. Dr. Woodbury holds a Doctorate of Chiropractic from Western States Chiropractic College in Portland, Oregon. He believes we were all born to be healthy and that our quality of life is directly dictated by our level of health. Dr. Woodbury’s passion is helping his patients achieve optimal health and well-being so that they may pursue their goals and fulfill their dreams. Dr. Woodbury is certified in Chiropractic Biophysics. He has over 200 hours of postgraduate training in structural spinal rehabilitation and correction. Chiropractic Biophysics is the most researched and published technique in chiropractic and he is always upgrading his standard of care based on new technology research and training. Dr. Woodbury is also certified in the Webster Technique, which is specifically designed to care for pregnant women to relieve and prevent common discomforts experienced during pregnancy and create an optimal environment for an easier and safer delivery. Throughout his career, he has witnessed the devastating effects of spinal injury. As a result, he holds certification in Graston Therapy, a specialized treatment for soft tissue injury and rehabilitation. He is also currently pursuing an advanced certification in whiplash and spinal diagnostics and treatment. 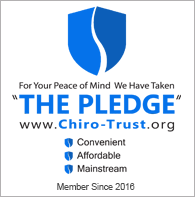 Dr. Woodbury is a member of the International Chiropractic Association, the Washington State Chiropractic Association, and the International Chiropractic Pediatric Association. Dr. Woodbury joined Hanson Chiropractic in 2007 and is proud to work with such an amazing team of caring doctors and chiropractic assistants. Dr. Woodbury lives in Snohomish with his wife and two young daughters. When he is not in the office, he loves spending time with his family and enjoys surfing, snowboarding, gardening, and playing bass and ukulele.